Welcome to Cinnamon Creek RV Park! Are you looking for a full hook-up RV Park? 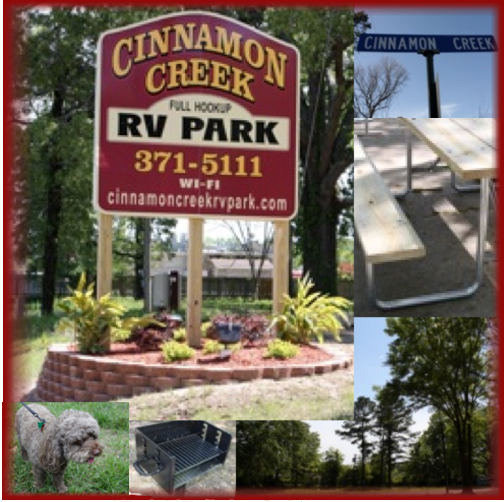 Cinnamon Creek RV Park is centrally located in northern Louisiana near Shreveport-Bossier and Minden with numerous attractions. These attractions along with the job opportunities of the pipeline industry associated with the Haynesville Shale make Cinnamon Creek the ideal choice for your RV Park needs. We try our best to make this your home away from home with many convenience features you don't want to be without. Our location brings you the convenience of being near many attractions such as Lake Bistineau, Caney Lake, Red River, Louisiana Downs, numerous casinos and more!